Found this while browsing at a used book fair. Wish I could remember the name of the book it was hiding inside, but I didn’t want to buy the book, so I put it back, but kept the note (score!). 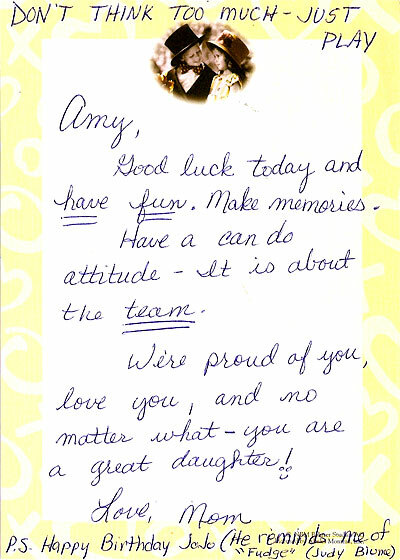 It’s a sweet note from a mom to her kid, a sort of pep talk before some kind of sports match. It sounds as if the kid is having some anguish borne from her athletic experience, and the mom feels compelled to give her some advice. The part at the bottom? A somewhat less emotional birthday greeting (from a different writer?) for “JoJo,” who reminds the writer of Judy Blume’s “Fudge.” “Don’t think – just play.” Very Zen.